A range vent hood can be both beautiful and practical, adding charm to the cooking area while also removing smoke, grease and fumes. The air drawn out of the kitchen must go somewhere, and a properly installed vent has ductwork leading to the outside. This duct should be designed to let air out, but not in. However, sometimes cold air manages to make its way in through the duct. A range vent hood is meant to draw air out, not let it in. Outside, at the end of the duct attached to your range hood, is a flap designed to prevent cold air from coming through the hood. When working properly, the flap should close when the vent fan is not in use, and open to let air escape when the fan is in use. This flap can be blown open by the wind, however, and let cold air into the home. It can also be damaged by wind or birds, or come off entirely. If damaged, the flap should be replaced. If it is frequently blown open by the wind, it should be turned another direction or replaced with a spring-loaded flap that cannot be opened by the wind. If the range vent hood is under warranty, check with the manufacturer before installing a spring-loaded flap. 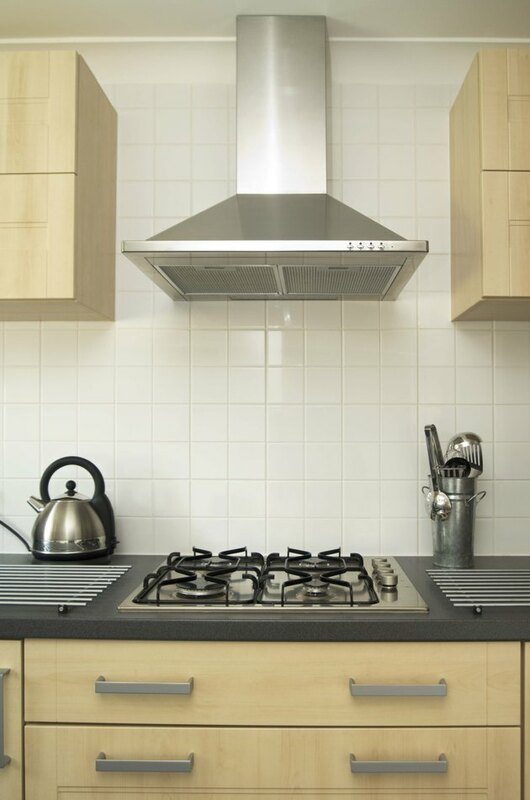 A spring-loaded damper, or flap at the end of the range hood vent, functions in the same way as a standard flap, except that it uses pressure from a spring to stay closed. This makes it difficult for the wind to open it. If a spring-loaded flap is allowing cold air in through the vent, the spring mechanism is likely damaged or broken, leaving the flap in the open position. The damper should be replaced if the spring is broken. It may also simply need to be cleaned and lubricated to open and close properly if the spring mechanism is not broken. Placement of the duct leading to the outside from the range vent hood can also increase or decrease problems with cold air coming in through the vent. A duct leading straight up to the outdoors practically invites cold air into the home since there is no resistance against cold air naturally "falling" down the duct. If repairing or replacing the damper does not stop the problem, the duct may need to be changed to include either a bend that creates resistance in air flow, or drops down to ground level to prevent cold air from falling into the vent. A small amount of cold air coming in through a range vent hood may not seem worth the effort of changing ductwork, but even a small air leak can make a big difference in heating costs. In addition, if the flap or duct is allowing air in, it is also providing an opening for bugs or other pests to come in through the vent. Leaves, dust and other debris may enter the vent during high winds, blocking the fan and shortening its life, or even entering the kitchen and falling on to the stove.